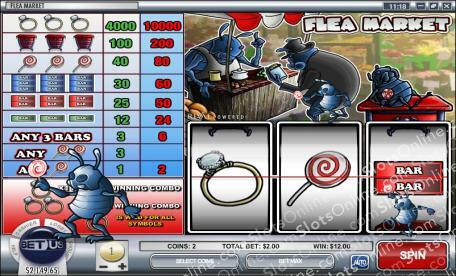 Take a trip to the Flea Market with the fleas to look over the merchandise and good deals. Click here to play! You might just see yourself returning home with more than just a few good deals! You might have to barter with a few of these shop owners, but one thing that you'll definitely want to pick up is a diamond ring. Three of these across the single pay line and you'll get up to 10000 coins! You'll also want to look over the chests because these drawers will bring in a pretty penny. If you spin three of them across the pay line you'll get up to 200 coins. You'll also find lollipops at this market. Spin three of these and you could take home up to 80 coins. Triple, double and single BARS will pay out, as do a few other combinations. Not only does the diamond ring pay out the most, but it also acts as a wild symbol and will replace all other symbols. You'll need to bet the maximum number of coins in this 3 reel slot in order to cash in on the biggest wins. So, take a trip to the flea market to have a look at all the good deals. You'll most likely end your trip with plenty of cash! The diamond ring acts as a wild symbol. It will replace all other symbols to help you create more winning combinations.